Tag Archive | "Rick Loper"
West Michigan Hawks defensive end Rick Loper. 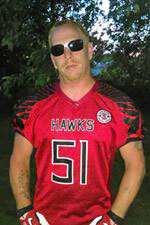 Meet West Michigan Hawks defensive end Rick Loper. Originally from Grand Rapids, Loper attended and graduated from Cedar Springs High School in 1998. He started playing football in third grade, and played all the way through school until graduation. He also wrestled and ran track in school, and found himself in the sport of mixed martial arts later in life. Known primarily for his classic “hat and shades” look, and his classic laugh, Loper has entrenched himself as a big piece of the team. Some of his role models include Michael Jordan, Barry Sanders, Shae Brophy, and his father Harrison Loper Sr. When he isn’t on the gridiron, some of Loper’s favorite things to do include hunting, fishing, camping, or anything else that involves being outside.